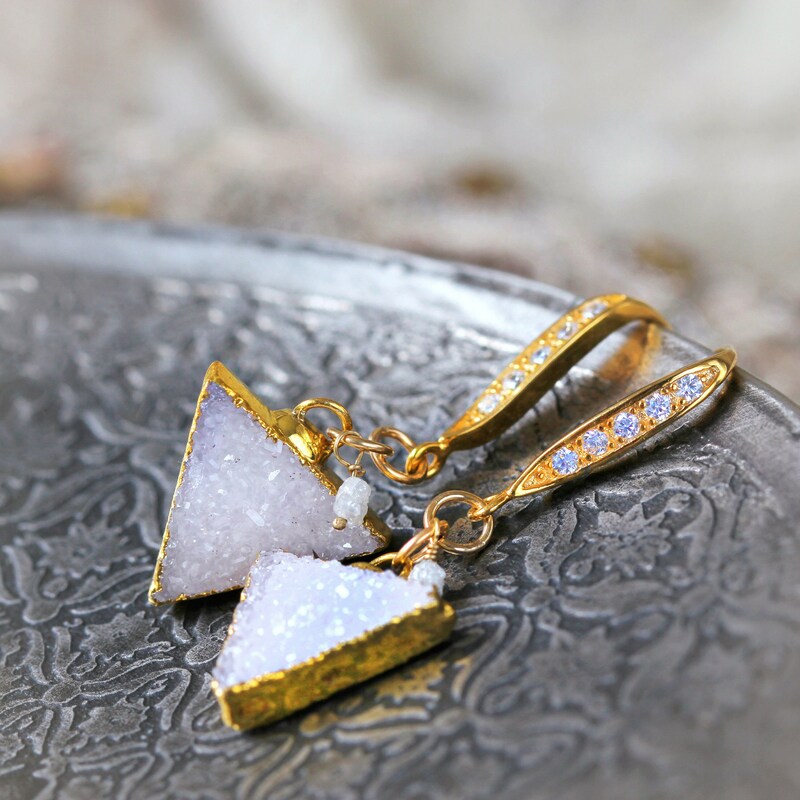 These stunning off white druzy and diamond earrings are the epitome of modern luxury, and will bring easy elegance to evenings out and special occasions! 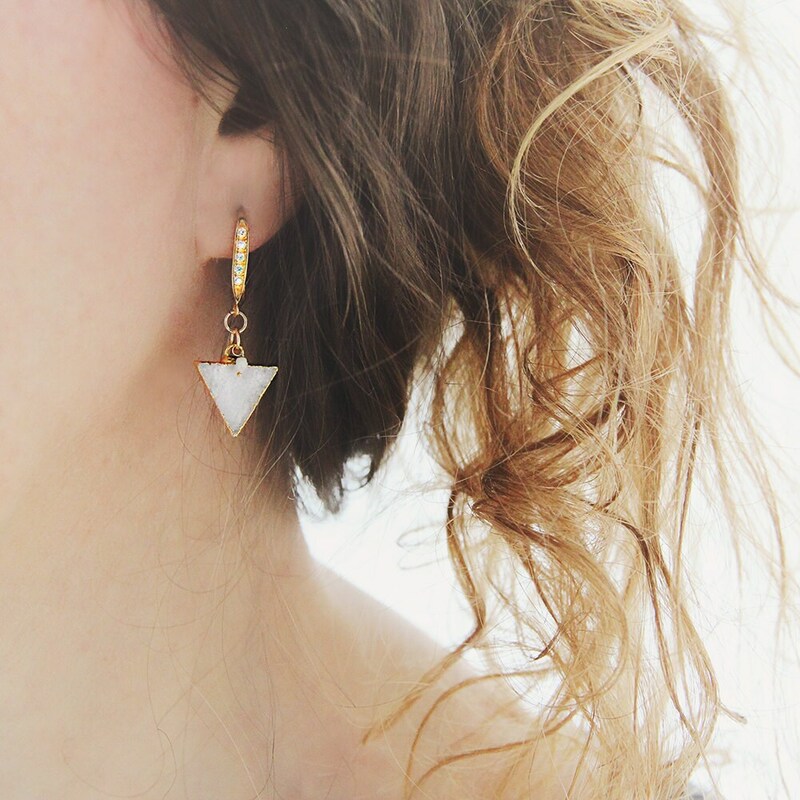 They are perfect party earrings, but will also help you breeze through all your days with style and ease. Wear casually with jeans and a jumper, or wow everyone with a cocktail or maxi dress. 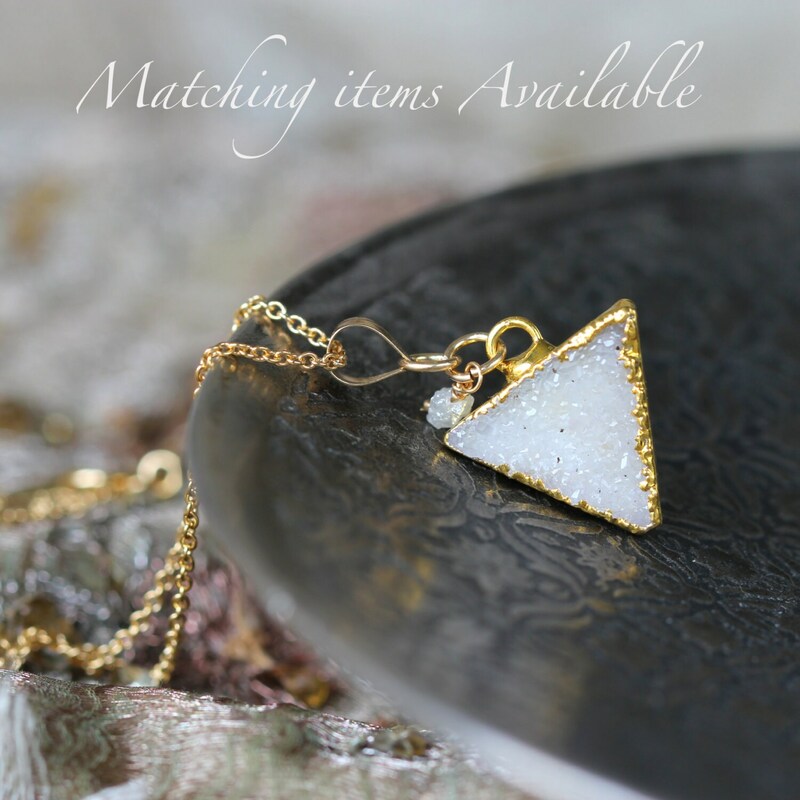 Featuring stunning grey-white druzy stones cut into a trendy triangle shape and framed with gold. These are great quality druzy stones - the colour is off-white with a lovely lilac-grey, tone. Hanging alongside is a single silvery-white rough Diamond. Beautiful, sleek 18K gold vermeil ear wires (solid 925 sterling silver base) with sparkling cubic zirconia stones set into the metal, finish these modern druzy earrings. 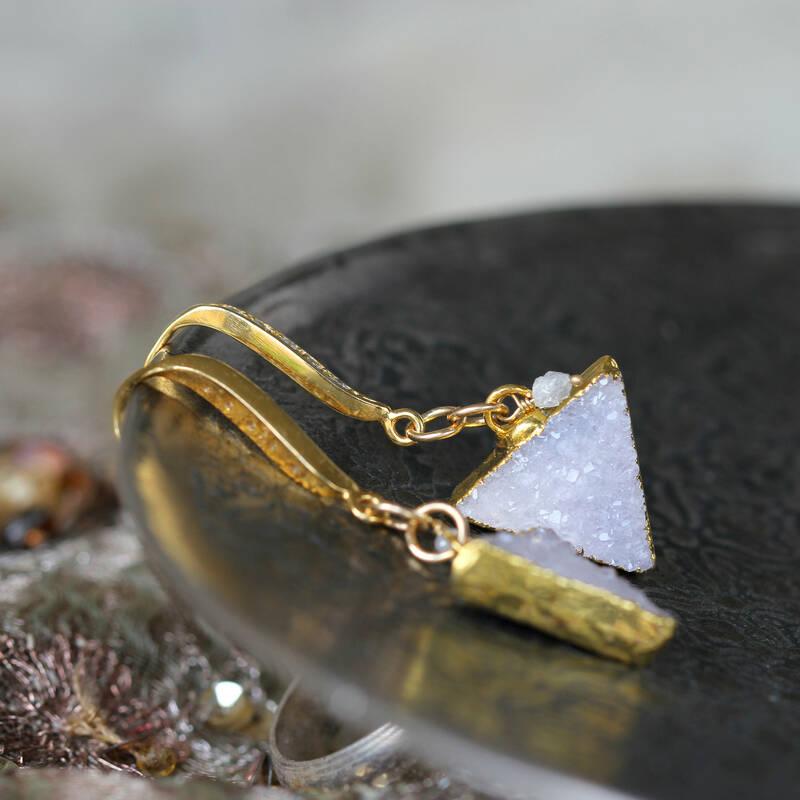 Lightweight, luxurious and easy to wear, these druzy triangle earrings make a fabulous gift for friends, family and loved ones. Or better still, just keep them for yourself! Sensational for brides and wedding parties. 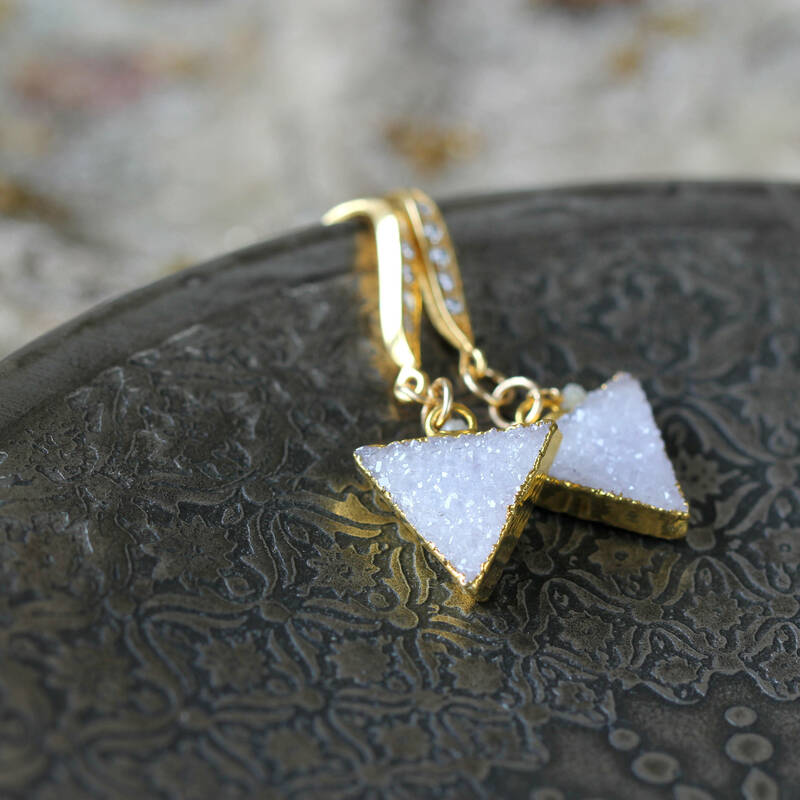 The Diamond is the birthstone for April, geometric jewellery is a hot growing trend, and druzy is always a winner, so it's hard to go wrong with these beautiful sparkling earrings! * Earrings measure approx 5 - 5.5cm from top to tail. * Druzy stones vary, but approx 12mm. Simply beautiful. And excellent customer service. These jumped off the page at me, I knew I had to have them for an upcoming vacation. Aside from looking unique, the workmanship is top notch. I was worried that they wouldn't arrive in time as I only had 10 days, didn't buy them until a Friday and had a weekend in there. The seller rose to the occasion and sent them forthwith. They arrived the day before we left on a 2-week vacation to the Amalfi coast. Super seller! Beautiful small earrings. Joanne is an artist!